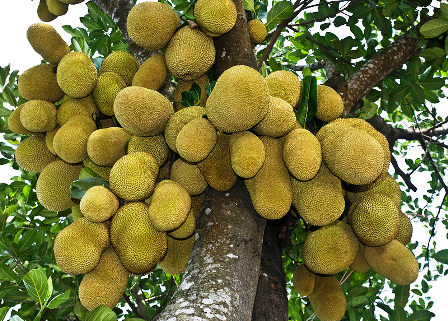 Jackfruit is popularly known as the poor mans food in the eastern and southern parts of India. A rich source of vitamin A, C, and minerals, it also supplies carbohydrates. 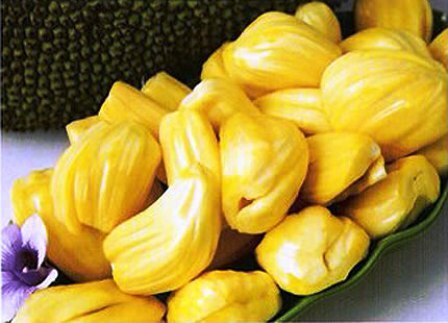 Tender jackfruits are popularly used as vegetable. The skin of the fruit and its leaves are excellent cattle feed. Its timber is valued for furniture making since it is rarely attacked by white ants. The latex from the bark contains resin. Pickles and dehydrated leather are its preserved delicacies. Canning of flakes can be done. They can be bottled and served after mixing with honey and sugar. Nectar is prepared from its pulp. The rind, rich in pectin, can be used for making jelly. The flakes, seeds, sterile flowers, skin and core contain calcium pectate 4.6, 1.6, 3.7, 3.2 and 2.1%, respectively. They are considered as good sources of pectin. 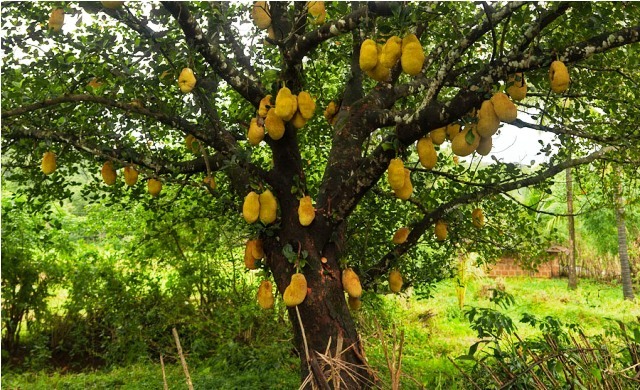 Jack fruit can be grown on a wide variety of soils but it grows well in a rich, deep, alluvial and well drained soil. It can also be grown on open textured or lateritic soil provided sufficient nutrients are available. It is preferred in homesteads, as a shade tree or as a mixed crop. It grows well in a warm, humid climate up to and elevation of 1,500 m. In south India, it performs satisfactorily in arid and warmer plains. However, it cannot tolerate cold and frost. Being a cross pollinated and mostly seed propagated; its innumerable types of fruits differ widely in density of spines, rind, bearing, size, shape, quality and period of maturity. Local selections are named as ‘gulabi’ (rose scented), ‘champa’ (favour like that of Magnolia flowers) and ‘hazar’ (bearing a thousand fruits). There are 2 broad groups in cultivated types soft fleshed and firm fleshed. Rudrakshi has common pumello sized fruits with smooth rind and less spines, whereas Singapore or Ceylon jack, introduced from Ceylon, is highly precocious. Sometimes it produces light off season crop between September and December. Muttam varikka is another important variety producing fruits of 7kg each. A lot of variability occurs in evergreen forests of the Western Ghats, Gorakhpur, Dewaria (40kg sized fruits) and Allahabad (small with white, juice and soft pulp) districts of Uttar Pradesh. Some of these types produce small to medium sized fruits with small seeds and thin skin offering a great potential for the varietal improvement. Jackfruit NJT1, NJT2, NJT3 and NJT4 collections from Faizabad, have large fruits of excellent quality with bulbs having low fibre. They are suitable for table purpose. NJC1, NJC2, NJC3 and NJ4 have small to medium sized fruits with thin rind and flesh. They are suitable for culinary purpose. Varikka, Koozha and Navarikka (Pazam Varikka) types are available in Kerala, Tamil Nadu, and Karnataka with maximum density in Wynad plateau in the Western Ghats. 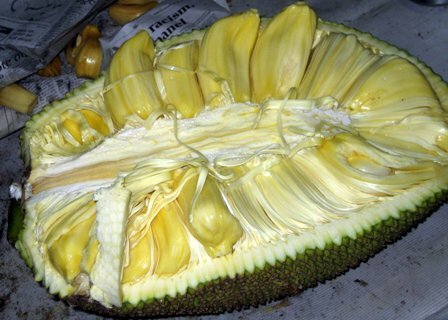 Jack fruit is commonly propagated through seeds. Seeds should be sown immediately after extraction since they lose their viability during storage. Soaking seeds in 25 ppm NAA for 24 hours improves their germination and seedling growth. Air layering, grafting (inarching and epicotyl) and budding (forkert, chip and patch) are means of its vegetative propagation. In Konkan, it gives a success of 50-90% through epicotyl grafting performed during April–May, with grafts attaining planting size within a year. The plants of jackfruit should be planted in a square system (hexagonal if the soil is less fertile) 12m apart. June-August is ideal time for planting. The tap root system along with plants should not be disturbed while planting. The young plants should be protected from stray goats and cattle. Protective irrigations are necessary initially at 12-15 days intervals depending on soil and climate conditions. The plants should be trained by removing lower branches. Source: Improved cultivation practices for Horticultural Crops 1997, UAS, Dharwad. Seedlings trees start bearing from seventh to eighth year onwards while the grafted ones from third year, when a few fruits may develop. Singapore variety starts yielding from third year of planting. The tree attains its peak bearing stage in about 15-16 years of planting. At this stage, normally a tree bears up to 250 fruits annually with annual fluctuations in yield. The weight of fruits also varies depending on the type. On an average about 40-50 tons of fruits/ ha could be obtained.